We're pleased to announce that Manhattan Borough President (elect) Gale Brewer will join us for our final R3 meeting of an eventful year. I'm sure we all remember how we felt when 421a tax abatements were approved in Albany and how we couldn't stop it from happening. At that point in time, how many of us would have predicted that the same piece of legislation would be the subject of an investigation, or that big real estate's dirty tactics would be repeatedly brought to light to by mainstream press? Or that the New York Post would write an article that called luxury real estate developers tax dodgers!? It's been an amazing year and we've built momentum heading into 2014. Come out and hear updates on the Moreland Commission Investigations, the Steering Committee, and plans to keep building momentum for 2015. Met Council on Housing is hosting a discussion on how to win this Saturday, Nov. 1610 a.m. to noonJudson Memorial Church, 55 Washington Sq. S. (wheelchair accessible). To pre-register, click HERE., or just show up. Forty organizations signed on to urge Mayor-Elect Bill de Blasio to preserve affordable housing, take concrete steps to end homelessness, and build new housing in a responsible way. 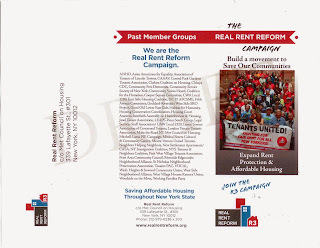 Our letter, Cure for a Tale of Two Cities, went to the De Blasio camp on November 6, 2013. "Talking Transition," a series of participatory events for advocates to shape the city's policies during the mayoral transition. Read about the project in today's NY Times. On Monday, we'll discuss a Path to "Real" Affordable Housing. R3 Brochures - Download them while they're hot! 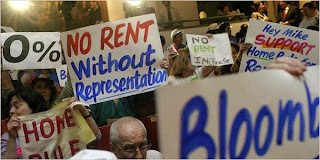 Let's organize tenants now to build a strong movement before the rent laws expire in June 2015. Bring folks into your organization and add them to R3. Strengthen your group and the broader tenant movement. Download the R3 brochure in COLOR or BLACK and WHITE. Contact Red Horse Strategies to have your organization's name added to the front of the brochure.